This is where you can find information about all the photo features here at The Paranormalist. If you want to add the practice to your life, and if you use any of those sites, feel free to “friend/follow” me, then join me in using the hashtag #hauntingphotoaday. I can’t promise I’ll notice all your shots, but it would be fun for me to see glimpses of your life when I do search the tag. My photo-a-day shots are sometimes ho-hum, sometimes off-topic, but they are memories all the same, which is why I archive them at Flickr. Sometimes, though, a particularly eerie subject presents itself, or I catch an perfectly haunting mood that I love. When that happens, I add the photograph to a special gallery hosted here, at The Paranormalist. The images in the Haunting Photos Gallery are drawn from direct submissions, and from the Halloween Photo Scavenger Hunt (see below) that I sponsor in September and October. Sometimes I request permission to post an image I see as I wander the web. (I’m a little shy about doing that, though.) I would love to feature your haunting photos alongside mine in the gallery. This is a photo-a-week for folks who crave dark fiction, enjoy a good scare, and love paranormal things. It is a challenging project in which you try to take one photograph each week which will appeal to people who perceive, even cultivate, a certain air of mystery in day-to-day life.The goal of the project is to develop and maintain an awareness of all the wonderfully creepy things that lurk around the edges of normalcy. The inspiration words can be interpreted in any way you like, as long as you stay within the spirit of the guidelines provided by the “Rules and Cautions” at the bottom of this page. Though I would love for folks to commit to taking a photograph each week, I have learned, from my own attempt, that’s a tall order. I’d like for this to be a fun, inclusive project. In the revised version, folks will be encouraged to participate as little, or as much, as they like. All submitted shots will be considered for inclusion in the Haunting Photos Gallery. 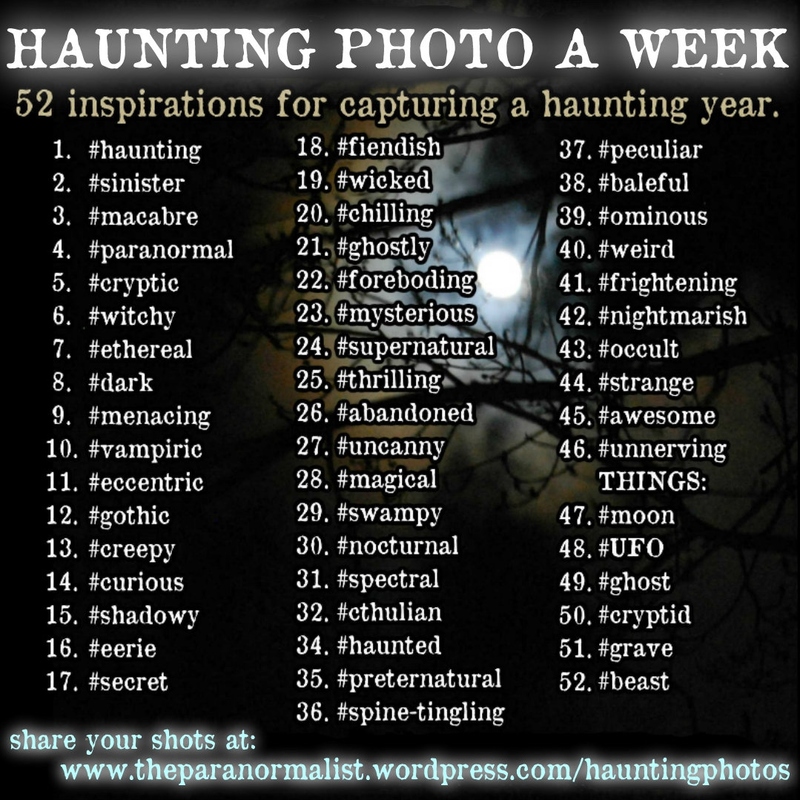 If you have an interest in taking on this challenge, I would be happy to set up a slideshow-style gallery for you (similar to the ones you can see on the 2014 Halloween Scavenger Hunt page, linked below) on the new Haunting Photo A Week Challenge page. Alternatively, I could make a prominent link to YOUR display of the project. I’d love to hear what you think of this idea in the comments below, or email me at hauntingphotos@gmail.com. UPDATE: The 2nd Annual Halloween Photo Hunt is up and running HERE. Don’t submit photographs that you, yourself, did not take. Don’t submit photos of yourself that others could use in a way that would harm you or your reputation. Don’t submit images that are gross, disgusting or overtly sexual. Feel free to put a watermark on your photograph if you hope to be recognized as its photographer in the event it becomes distributed on the web. Don’t submit any image that is not directly related to the theme of haunting photos. No ads or promotions. *Note: Some photographs in the gallery, taken by me, Renae Rude, do show recognizable people. I have model release forms signed by the subjects of those photos on file. CC0: By submitting a photo to the address hauntingphotos@gmail.com, you are agreeing that the photograph is licensed under CC0 (Creative Commons Zero) That means you hold no copyright at all to the photograph. I will label submissions with a photo credit, linked to a social media site owned by the photographer, if the photographer provides that information to me when submitting, but I am not legally required to do so. To understand more about the CC0 license, click the icon below. To the extent possible under law, Renae Rude has waived all copyright and related or neighboring rights to this work. This work is published from: United States.